Bio: Unlike most fighters, Cummins may be safer in the cage than in her day job. The Missouri native works as a police officer and volunteers for St. Louis Pet Rescue on a regular basis. After going a perfect 8-0 as an amateur, Cummins turned pro in 2011. After scoring back-to-back wins to open her career, Cummins was signed to Invicta and competed at the promotion’s inaugural event in 2012. 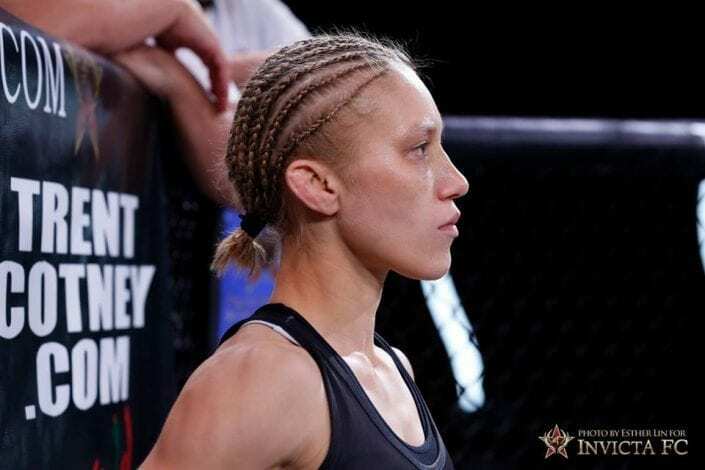 Since then, she’s faced a gauntlet of the strawweight division’s best, including Joanne Calderwood and Alexa Grasso. However, in 2015, Cummins revealed her plans to drop to atomweight. I started training MMA in 2007. I wanted to challenge myself physically and mentally. Growing up I did soccer, rugby and tae kwon do. In my spare time I rescue stray and abused cats and dogs. I am very honored to be fighting for the biggest WMMA organization and to be with some of the top fighters in the world. I never gave up on my dreams and overcame adversity.